Rely upon Accurate Roofing and Siding LLC for your entire commercial and home roof needs. Since 1987, we've offered complete roof and outside systems services in NJ and Pennsylvania. We have been a family-owned and managed company that established high standards right from the start and built long-term success through focused effort. Protect your premises with roof covering systems that are affordable, durable, and versatile! Get the reliable roofer services that established Accurate among the top Rushland, PA roofer companies. When you select Accurate Roofing & Siding, you're guaranteeing the best quality materials and workmanship for your roofing job. We work hard to attain the best performing roofing structure and beautiful, customized exterior personalized to your preference and budget. We will make sure that your roof can last for a long time and effectively stand up to the test of time. Accurate Roofing and Siding installs and replaces home and commercial shingle and flat roofing systems, and gutters. Vinyl and fiber concrete, aluminum siding, natural stone exteriors, home windows, and doors--we offer complete external systems set up. Siding exteriors are completed with decorative moulding, and accent details to establish your own style. If you're considering replacing the siding on your home, but you want to know what the real cost to replace siding is then read on and find out! Water damage to your home costs an average of $8,861. This does not include the damage hiding beneath and behind surfaces. Small leaks, condensation, and hidden mold can grow unabated in the space between your siding and walls. Your home's siding protects you from the blistering sun, chilling winds, harsh winters, and drenching downpours. It does all of this without complaint for decades. Unfortunately, even with proper maintenance, even the best siding gets worn out by the elements. Trying to decide between repair or replacement? Read on to learn the real cost to replace siding vs. the cost of repairs. A telltale sign of siding trouble is a persistent mustiness or smell of damp. If you have visual signs of rot, mildew or mold, immediately check it out. It could be an easy to correct plumbing issue or a sign that your current exterior siding is failing. If there is damaged siding to blame, you might need to repair the section, or the insulation, or both. If the damage is extensive or in many places, you might need to look at replacement. Don't ignore the moisture. Even minor water damage promotes the growth of mold. Mold spores travel through the air. That means that even a small water leak can have long-lasting health risks. Most insurance companies limit mold abatement payments. When making an analysis of the cost to replace siding, don't forget to include the benefit of a dry and healthy home! Extreme weather can damage your siding. A crack, hole or rotted wood can let heat or cold escape into the air. If the area is small, a bit of foam insulation sprayed into the spot will help until a permanent repair is made. Repairs are unsightly though. There is almost no way to match or blend in wood or vinyl siding due to weathering. A high-quality fiber cement siding adds to your home's curb appeal as well as protecting you from the elements. It has an estimated life of 25 years, is low maintenance and quick to install. In combination with insulation, fiber cement siding is energy efficient, too. Fiber cement offers the look of cedar with less cost. Repairing old cedar siding is time-consuming and expensive, especially if the damage is extensive. Additionally, modern materials will never match the older wood siding. Use fiber cement siding to replace wood for approximately one-third less materials cost. Installation is easier too. New vinyl siding is waterproof, rustproof, and corrosion proof. Some siding is virtually maintenance free for up to 25 years. Since repair of damaged vinyl is almost impossible to do invisibly, replacement of damage vinyl with new siding is cost-effective. If you have damaged siding letting in water or air, you must fix the problem. For small areas, repairs are a good choice. However, larger areas that require removal of a section of siding never match. 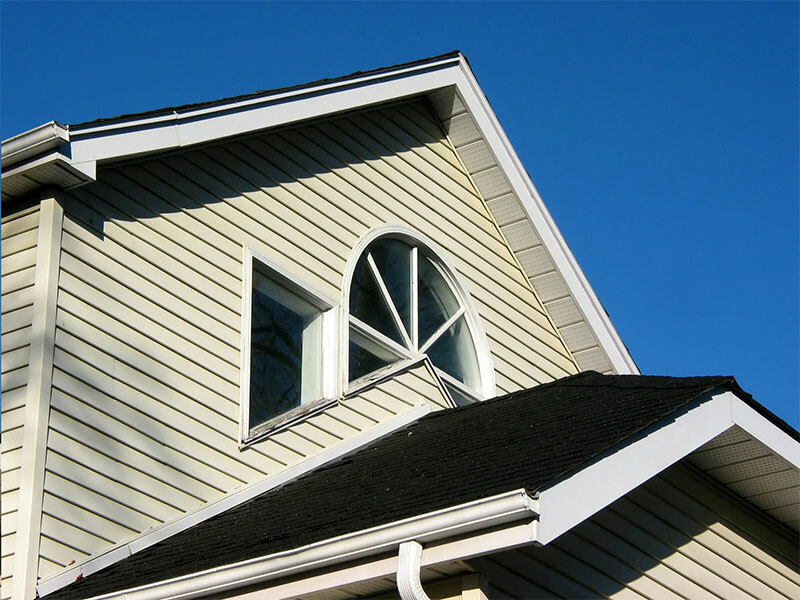 For an accurate estimate of the cost to replace siding on your home in Wrightstown PA – Bucks County, call us today.